In 1973, at 20 years old, Daniel Meadows embarked on raising funds for an ambitious project, ‘The Free Photographic Omnibus’, with the aim of conducting a countrywide photographic survey of the ‘English people’, especially those whose quality of life he believed to be under threat. Meadows covered almost 10 000 miles over the subsequent 13 months in a double decker bus converted into a living space, dark room and photographic studio making 958 portraits in 22 different towns. An important aspect of the project was to give away photographs free of charge to the people who chose to contribute, a strategy Meadows hoped would encourage participation. The body of work was presented in a 1975 exhibition and book, ‘Living Like This’, sponsored by the Arts Council. A large portion of Guy Lane’s essay ‘The Photographer as Recorder’, is dedicated to a flyer Meadows produced to raise the £3000 he required to complete the project. 1000 leaflets were produced for distribution, many more than would have been required for the contacts Meadows had at the time, and, subsequently, he has spoken of his desire to persuade a lot of people to give a little – an innovative precursor to crowdfunding. As well as announcing the nature of Meadows concerns for his project, Lane believes the flyer addresses the state of English documentary in the early 1970s and its attempts to engage, exhort and solicit a readership sympathetic to photography’s possibilities: “the statement belongs to a particularly fluid moment in English photographic history – a moment during which it became possible to imagine an authorised past and an invigorated future.” In his statement, Meadows identifies, in elegiac terms, ills that were a preoccupation of British society at the time – social change, overpopulation and environmental concerns. Alongside this, he expresses a desire to record conker championships and Blackpool beach, a shift of tone that shows a degree of humour and whimsy in keeping with contemporaries such as Tony Ray-Jones, Homer Sykes and Patrick Ward. Meadows cites the work of Sir Benjamin Stone as the last attempt to create a ‘straight’ record of the English. Stone founded the National Photographic Record Association and travelled across England at the turn of the century with the aim of producing a “historical record of English life” using a process of “recording photography”. Meadows alignment with the earlier project suggests a shared moral view about creating ‘straight’ photographic records unhindered by the workings of the camera. Lane also comments that the desire to record lives blighted by the process of modernity is a particular characteristic of much post-war documentary work. Lane reads the self-portrait Meadows placed on the flyers as being significant. The photograph is unremarkable which suggests an ordinariness and lack of artistry which is neither professional, commercial or amateur. The connotations of youthfulness the image presents are achieved, not only because of Meadows age (something he is at pains to point out in the text) but in the bus itself which had become a countercultural icon evoking the hedonistic road trip and hippyish communality. Meadows identity as a photographer is established in terms of alignment and affinity, opposition and difference. The fact his practice was uncontaminated by the constraints of commissioned work and his expression of the importance of producing a straight record signified truthfulness, humility and sincerity. Undoubtedly, the passage of time makes the fashion choices of the participants the first thing that strikes attention, however, I find myself wondering about where they are now, what the lives have become and constructing narratives. My eye is drawn to similarities and differences in the individual pictures, how one of the sitters holds themselves, whether they smile or not – to small details. This picture of a teddy boy and his girlfriend or wife is one such example. He looks confident, she looks slightly coy, his arm around her is apparently protective until you notice her black eye and are forced to reevaluate everything you have seen. 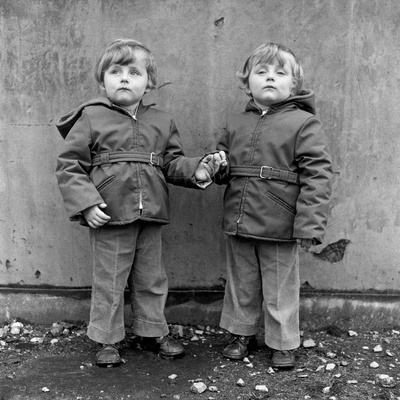 This picture of twins emphasises the strength of looking at similarities in a single frame, the children are almost a mirror image of each other with their identical clothing and looks, but, the subtle differences remind us of their individuality. 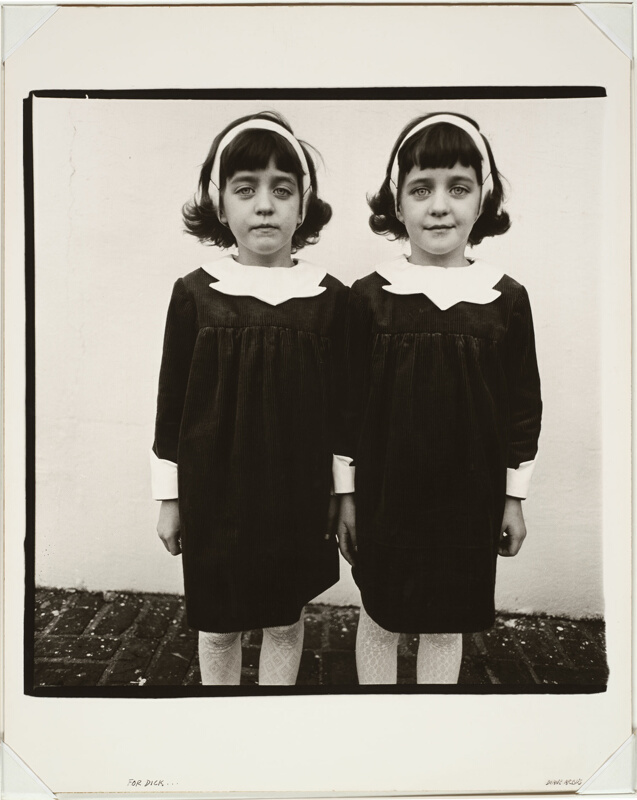 I cannot help but be reminded of Diane Arbus’ picture of twins, a comparison which reminds me of the huge difference in both photographer’s intent while also showing that this is only ever part of the story when evaluating their work.